Herbal product retailer Bio Health are launching a print advertising campaign with Press Mag Media, targeting female audiences with a range of products designed to relieve various ailments. By appearing in Psychologies magazine, Bio Health will directly access their target audience of health-conscious females. Herbal product retailer Bio Health are launching a print advertising campaign with Press Mag Media, targeting female audiences with a range of products designed to relieve various ailments. The full page advert will feature in the September issue of specialist interest women’s magazine "Psychologies", which focuses on personal well-being and health. 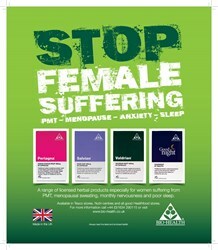 A lime green backdrop is used to project the health-focused advert, with the powerful headline "stop female suffering". Four herbal products are promoted, individually aimed at reducing the effects of PMT, menopause, anxiety and lack of sleep. The Bio Health logo and a "made in the UK" stamp both endorse the range of capsules and tablets, with a contact telephone number and web address printed below, along with the text "available in Tesco stores". By appearing in Psychologies magazine, Bio Health will directly access their target audience of health-conscious females, thus giving their products effective and relevant exposure whilst eliminating advertising wastage.